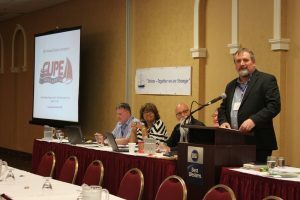 CUPE National President Mark Hancock gave his opening remarks today. He focused on the need to oppose austerity, two-tier contracts and the growing concern of precarious work – work that is temporary, short term, part-time, casual and contract. Hancock warned that the McNeil government’s privatization rampant agenda would only create more precarious work. “Will you stand with me to fight against hate, division and austerity? Will you stand with me to build a better future for our members and for all Canadians?” Hancock asked. The 280 people in the room stood and cheered their agreement. 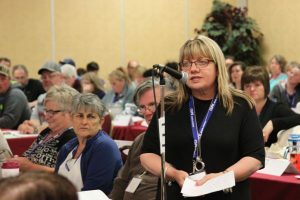 Delegated debated a range of issues and passed many resolutions on Monday, including support for public water, support for a higher provincial minimum wage and increased public awareness against domestic violence and intimate partner abuse, among other issues. CUPE Nova Scotia’s Women’s Committee submitted the resolution on violence. 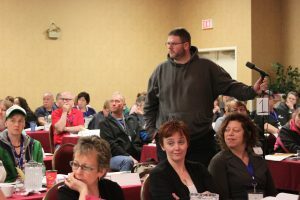 Delegates told stories that underscored the urgency – and life or death nature – of the issue, and the need for our union to keep working to prevent violence and support its victims. 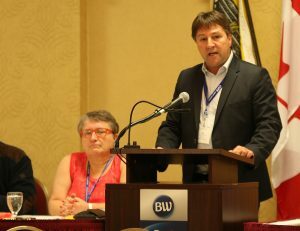 Delegates engaged in many thorough discussions today, including the need to increase the province’s minimum wage to $15/hour, a resolution submitted by CUPE Local 108. Delegates supported the call for the union to continue to participate in the Nova Scotia Needs a Raise Coalition. Delegates supported resolutions on the merits of public water and water justice. CUPE Nova Scotia Global Justice Committee sponsored a resolution encouraging locals to organize to declare their municipalities “Blue Communities” and to fight the bottled water industry. 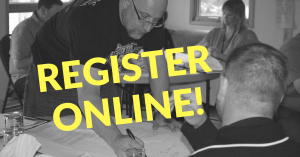 CUPE 227, meanwhile, brought forward the call to continue to campaign for water justice for indigenous communities, noting that 73 percent of Indigenous communities are at high or medium risk of waterborne contamination. Both resolutions passed. Delegates also passed several constitutional amendments. 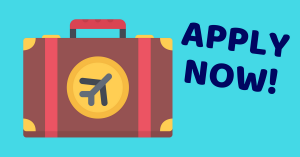 They included a new requirement that Division budget updates take place at all table officer meetings; an expanded role for the VP Equity to support equity- seeking efforts beyond Anti-Racism; and a commitment to provide communications updates electronically. 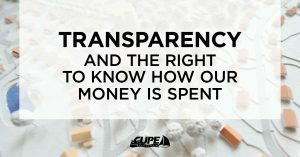 Charles Fleury, CUPE National Secretary- Treasurer, encouraged members to fight back against the failed policy of using public-private partnerships (P3s) to build much-needed new infrastructure, schools and hospitals. “That is not what our members and Nova Scotians deserve. Wherever things like these happen in Canada, we have to fight back,” Fleury said. Fleury thanked the convention delegates for standing up for each other, for public services and for our communities. “When our members stand up in their workplaces and in their communities, nothing can stop them,” Fleury said. In closing, Fleury encouraged locals to submit their Trustees’ Reports and he reminded delegates of the educational and training opportunities available to help union financial officers grow in their roles. 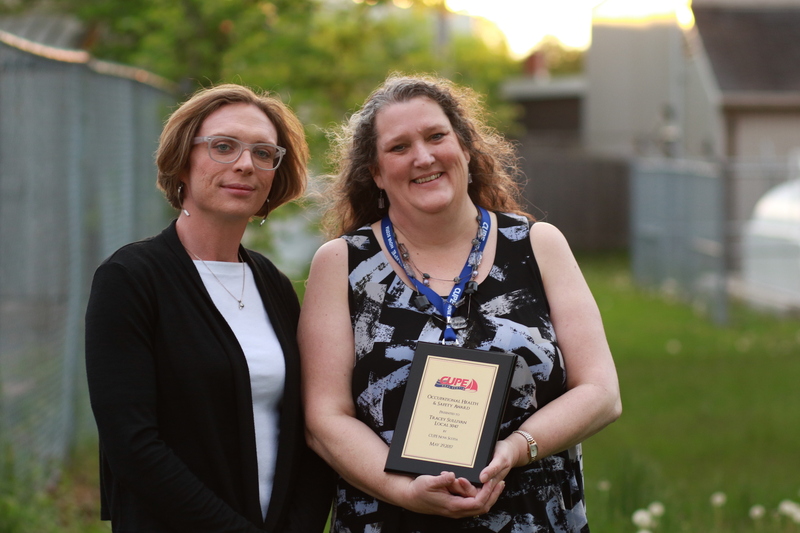 Congratulations to Tracey Sullivan, member of CUPE Local 5047 – this year’s recipient of the CUPE Nova Scotia Occupational Health and Safety Award! Download a printable copy of the Monday bulletin.